This last weekend was my bachelorette party. In tradition of my bff-MOH, Lanna, I would like to style this post in the same manner of many of our conversations where most sentences, if not all, begin with the phrase, “I’m really glad that…” So, here it goes. 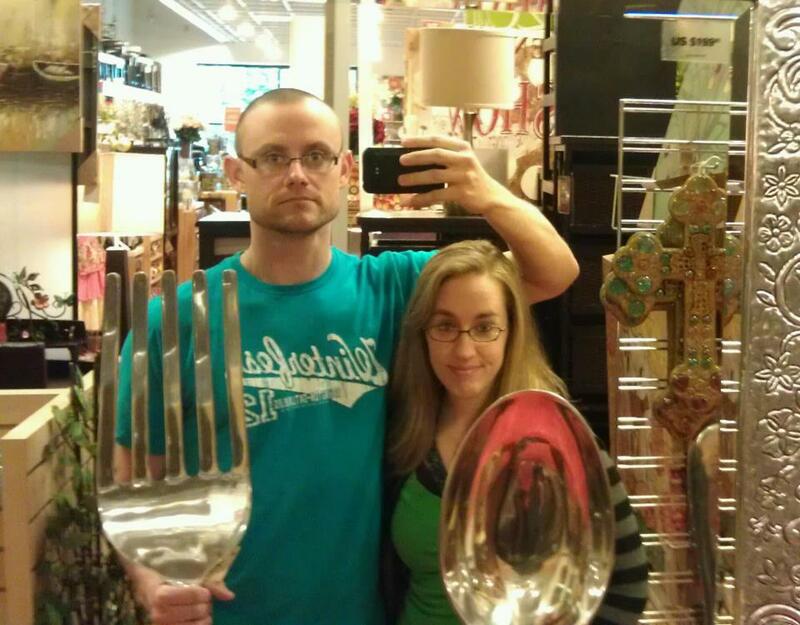 I’m really glad that I have one more week until the wedding!!! Eek! I’m really glad that I have a small group of close friends who are willing to come out for my bachelorette party for as long as they can until their wifey-motherly responsibilities call them elsewhere. It is entirely acceptable and I am just glad to be wedged into busy schedules that I myself am captive to. I’m really glad for pastor’s wives who are dear friends and mentors as well who are willing to throw brunches for an unknown number of ladies involved in the wedding. What a blessing! I’m really glad for flower girls who come to said brunches and refuse to kiss my cheek but want me to catch them to kiss theirs. I’m really glad for practical married friends who give comfortable and realistic gifts at bachelorette parties. They were all very pretty too. It pays to wait to get married when you’re a little older. I’m really glad that my friends will try new ethnic foods with me. 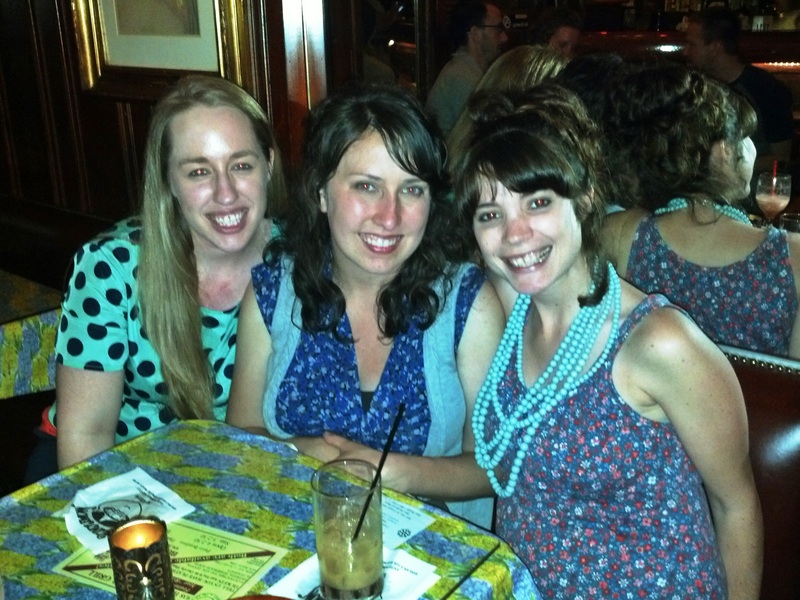 Eritrean/Ethiopian food is so yummy and communal – sorry Emily for all the spices. I’m really glad that I charged my camera all day to just not take it with me and that I only took this picture the whole evening. I’m really glad for the tradition of The Blind Lemon in Mt Adams. I’m really glad for ordering a strawberry colada with alcohol this time. I’m really glad that I did not actually witness Virginia, though. Poor Lanna and Amy. I’m really glad for a very dear friend who gets visibly angry that she hasn’t seen the new Iron Man movie …and upsets the baby. 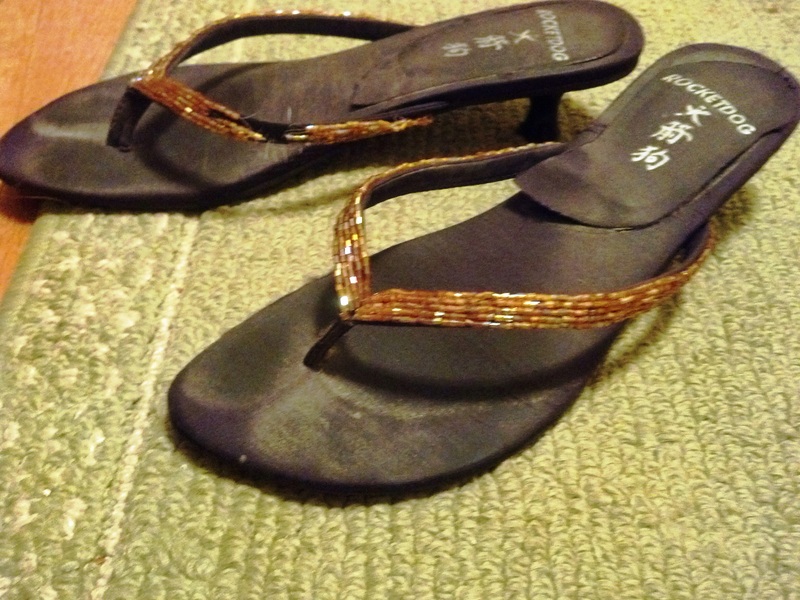 I’m really glad for dressy flip flops. This is what I wore for the night. Disregard the feet marks and general wear. I’m really glad that Friday was my last day floating to the other Cincinnati branches for work. I will now only be in two branches and the second is within 10 minutes of The House. I’m really glad for hole-in-the-wall, Tardis technology antique malls. This place was bigger on the inside! 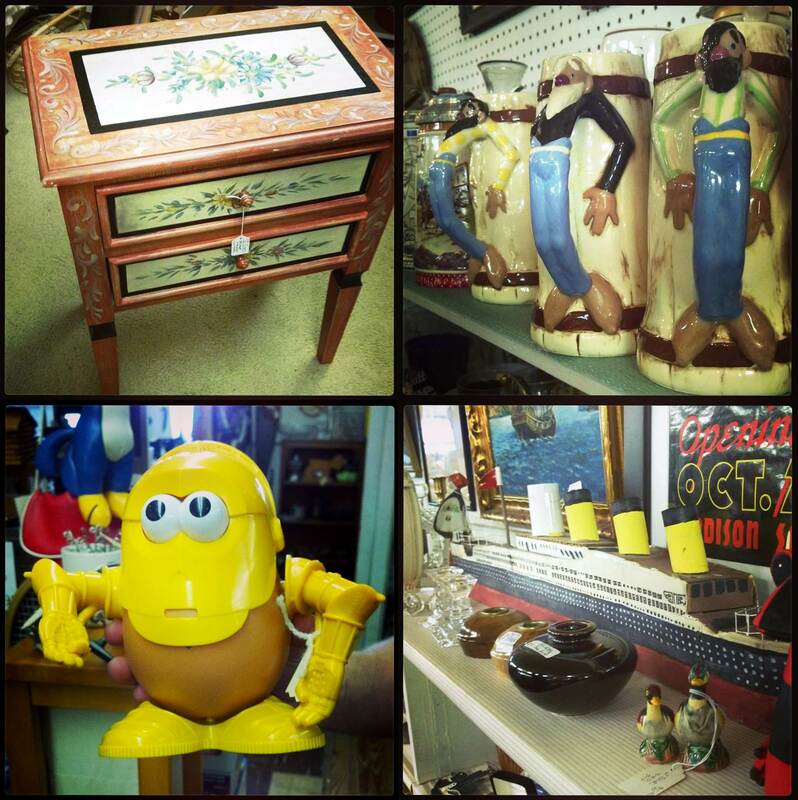 Clockwise from top left: hand-painted table; beer mugs; cardboard Titanic; C3PO Mister Potatohead. 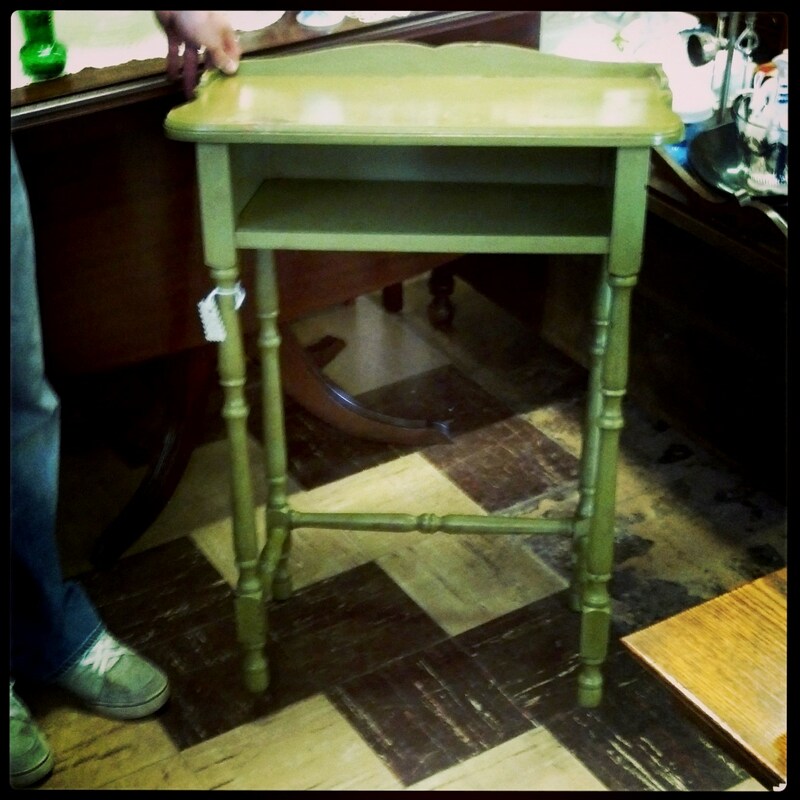 I’m really glad for vanity tables to rehab for only $38. I’m really glad (this one is kind of hard) that I have such an amazing church. This Sunday is my last regular attendance there and it’s going to be really sad (not really glad), but I am trying my best to look beyond that to what God might have in store for us. I’ve left the church before, but that was always with the knowledge that I would hop a big plane in a certain reasonable period of time and be back. Please pray for me. I’m really glad for a fiance who takes pictures of the flowers at The House for me to see when I’m not going to be up there for a few days. 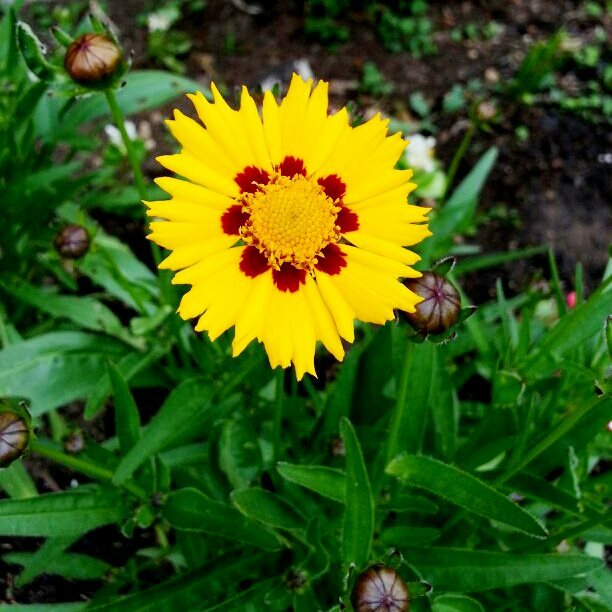 Such lovely tickseed. Our wedding colors AND it’s a native Ohio flower! I’m really glad for pottery that turns out exactly how you envisioned it when you first put the glaze on. It’s a piggy bank and he has a cute little red tail to match his wings. I think I’ll call him Stewart. I’m really glad that Matt and I are staying home for the week after to get used to The House and relaxing together. I’m really glad that I have to work only three days next week. This entry was posted in Cincinnati Businesses, Cincinnati, Ohio, Getting Married, Rose #1 (and Other Growing Things) and tagged antiquing, bachelorette, C3PO, Cincinnati, Getting Married, Relationships, tickseed, wedding. Bookmark the permalink. Oh Virginia, that saucy minx!